This form is a subordination, attornment and non-disturbance agreement (commonly referred to as SNDA) designed for a commercial lease. The document effects a subordination of the tenant’s lease to the financing encumbering the property, and provides the tenant with some measure of possessory rights if the landlord finds itself in default under the financing. 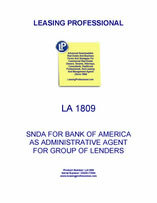 This Bank of America SNDA form is a subordination, attornment and non-disturbance agreement (commonly referred to as SNDA) designed for a commercial lease. The document subordinates the tenant’s lease to the financing encumbering the property, and provides the tenant with some measure of possessory rights if the landlord finds itself in default under the financing. In such a case, the tenant will not be disturbed if it continues to pay rent and otherwise perform under the lease. 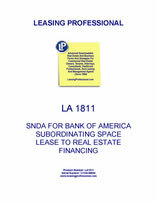 This US Bank SNDA form is a subordination, attornment and non-disturbance agreement (commonly referred to as SNDA) designed for a commercial lease in the property subject to the bank's real estate financing. 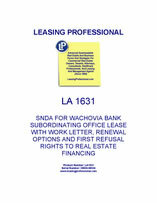 This SNDA also contains pro-lender provisions in the event the lender forecloses on the property. 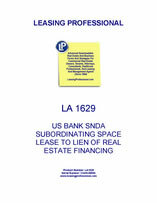 In such a case, among other things, the lender will not be (a) liable for any act or omission of any prior landlord; or (b) subject to any offsets or defenses which the tenant might have against any prior landlord; or (c) bound by any rent or additional rent or advance rent which the tenant might have paid more than one month in advance of the then current month to any prior landlord; or (d) bound by any amendment or modification of the lease made after the date hereof without the bank's written consent.